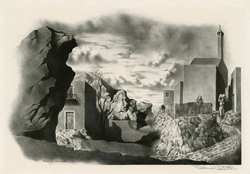 Spanish Landscape - 1938, Lithograph. Freundlich 5. Edition 20. Signed in pencil. Signed in the stone, lower left. Image size 9 15/16 x 15 inches (252 x 381 mm); sheet size 12 15/16 x 16 11/16 inches (329 x 424 mm). A superb, clean impression, with full margins (9/16 to 1 9/16 inches) on cream wove paper. Original brown paper hinges in the top left and right sheet corners verso; very slight light toning within a previous mat opening, otherwise in excellent condition. Scarce. 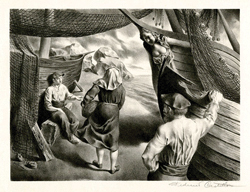 Reproduced: The Print Collector’s Quarterly, Inter-Collegiate Press, April, 1939; Federico Castellon, His Graphic Works, 1936-1971, August L. Freundlich, Syracuse University, 1978; In the Eye of the Storm: An Art of Conscience, 1930-1970, Francis K. Pohl, Chameleon Books Inc., New York, NY, 1995..
Castellon was honored with one-man exhibitions in the Hall of Fame in San Francisco, and in Bennington and Swarthmore Colleges. 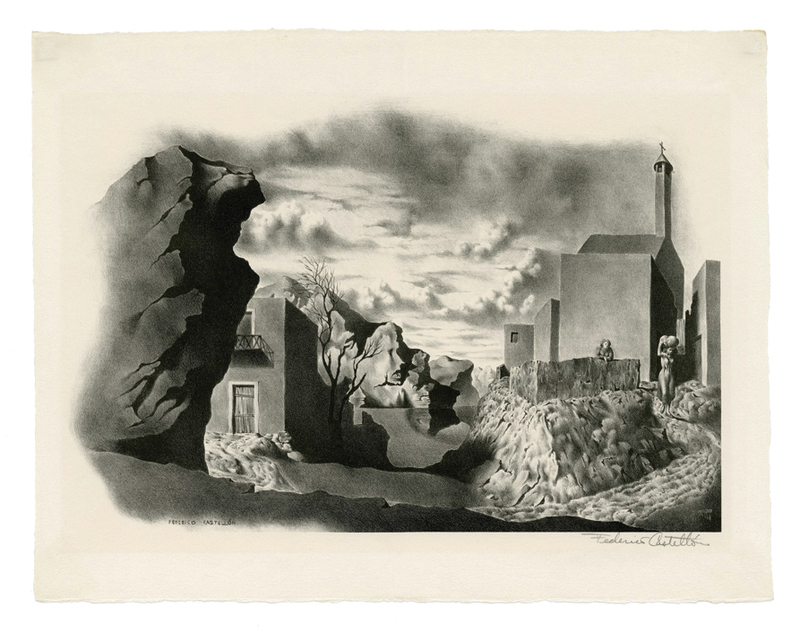 He was awarded two Guggenheim fellowships and participated in the Paris Exhibition of Spanish Artists that included Pablo Picasso, Juan Gris, and Joan Miró. 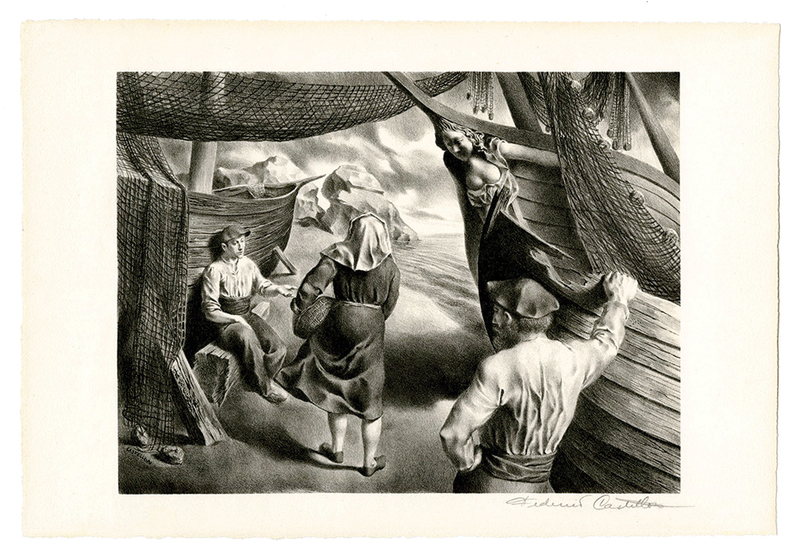 Collections: Brooklyn Museum, Carnegie Museum of Art..
By the Arks - 1941, Lithograph. Freundlich 10D. Edition 250. Signed in pencil. Signed in the stone, lower left. Image size 9 x 12 inches (228 x 305 mm); sheet size 11 x 16 1/8 inches (279 x 410 mm). A fine, rich impression, on cream wove paper, with full margins (7/8 to 2 1/8 inches), in excellent condition. Published by Associated American Artists, New York. Collections: Pennsylvania Academy of the Fine Arts, Portland Art Museum, Smithsonian American Art Museum, Springfield Museum of Art, Washington County Museum of Fine Arts.